There is something about an island – the isolation, the sea breezes and, of course, the beaches. But the most alluring islands offer a mix of relaxation and activity that sets them apart. Trip Advisor named 10 must-see islands, based on recommendations from travelers. 1. Ko Phi Phi Don, Thailand. This is the largest of the Phi Phi islands, and it is accessible only by boat. It is well-known for its beautiful beaches and its spectacular diving and snorkeling. In fact, much of the island is a marine reserve. 2. Bali, Indonesia. You can relax or find adventure on this gorgeous island. The blue waters off the white sand beaches offer many opportunities for diving and snorkeling. You also can venture into the jungle to see monkeys and old stone temples, or hike to the top of Mount Batur. 3. Galapagos Islands, Ecuador. Made famous by Charles Darwin, these isolated islands harbor unique species that Darwin used to support his theory of evolution. You see many of these animals, including the Galapagos tortoises, as you hike Darwin’s Trail or snorkel off the beaches. Tourist numbers are strictly regulated, so you need to book through an approved tour company. 4. Easter Island, Chile. No one really knows who carved the gigantic stone figures 1,500 years ago – or why – but they continue to draw people to contemplate their mysteries. Nearly half the island, located about 2,000 miles off Chile, is a World Heritage site. 5. Ischia, Italy. Curative spas are the main draw on Ischia, the largest island in the Bay of Naples. But it also is home to ancient structures and lively towns. 6. Sri Lanka. This island nation has magnificent diving and snorkeling. And you can visit a refuge for orphaned elephants as well as tea plantations and ancient shrines. 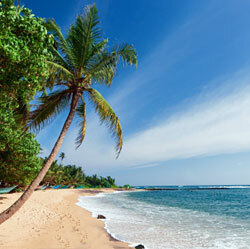 Sri Lanka boasts six World Heritage Sites. 7. Santorini, Greece. Parts of this picturesque town seem to cling to cliffs above an azure sea. Visitors can explore the ancient town of Akrotiri, preserved in volcanic ash, and sample the island’s nightlife. 8. Madagascar. Located in the Indian Ocean off Africa, Madagascar is the fourth-largest island in the world. Because of its size and its distance from other land areas, Madagascar is rich in exotic and unusual plants and animals, including a large number of lemur species found only on the island. 9. Anguilla, Caribbean. As part of the British West Indies, Anguilla is an English-speaking island that boasts crystal-clear water for diving or snorkeling, and white-sand beaches for relaxing. 10. Maui, Hawaii. Home to a volcano, a series of waterfalls and one of the most beautiful and treacherous roadways in the world – the road to Hana – Maui has something for everyone. And on top of that, it has some of the most gorgeous black sand and white sand beaches found anywhere.